3 - 3..........Argus vom Neroberg. 3 - 4..........Dixi von Krakau. 3 - 4..........Astor v.d. Schimmel Schulz Heide. 4 - 5..........Dirk vom Goldberg. Yago von Ellendonk passed the Körung 'for life' with highest rating for hardness and working drives and lived to 8 years of age. His sire, Satan von Ellendonk, passed the Körung with highest ratings for hardness and working drives. Satan's litter-brother, Sanko von Ellendonk, also passed the Körung with highest ratings for hardness and working drives. Yago is linebred 3 - 4 on, Dixi von Krakau, who in turn is the foundation female for the legendary von Ellendonk Kennel and winner of the D.V. Meisterschaft in 1964. Akim: SchH 3, FH, DV-DM participant and passed the Körung 'for Life' with highest rating for hardness and working drives. Sire of the von der Weyermühle “B” litter (Boris, Bingo) and von der Mooreiche “B” litter (Bo). Aick: SchH 3 and scored highly many times in protection (98 points in the 1982 Nordrhein Prüfung). Alice: SchH 1 and foundation female for the van Fellowstolz kennel in the Netherlands. Enno: SchH 1 and passed the ZTP with 1A rating for character and V for conformation. 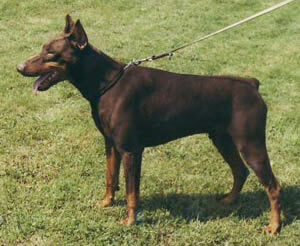 He is sire of the von Bayern “H” litter (Heidi).